The Illuminati (13 Ruling Families) is a ritualistic organization. It uses numbers for ritualistic witchcraft. It was involved in many "christian" crusades. The number 11 is the number of destruction and judgment and the death of man. Any event or thing assigned with the number 11 aids in the appearance of the Antichrist. In Latin, the Devil’s name is LVX which translates as (50 + 5 + 10 = 65 = 6+5 =11). Armistice Day - Remembrance Day is November 11 at 11:11 (Triple 11). 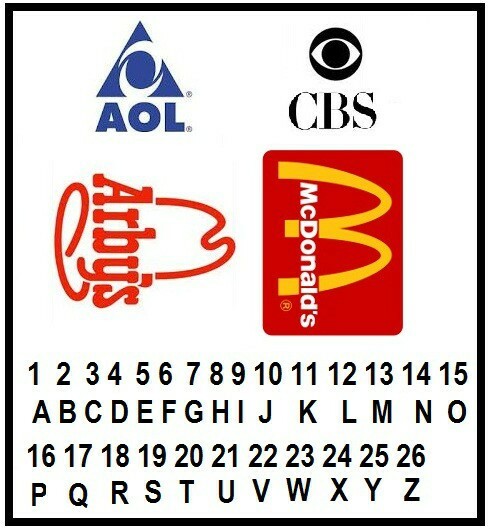 Can you see the number "13" in the McDonald's and Arby's logos? The first secret code often used by kids is the alphabet with a number above each letter. The code starts with the letter A with the number 1 above it and it ends with Z which represents the number 26. Kids pass coded letters to friends in class using this hidden code. It is one of the simplest codes there is. McDonalds restaurant. The big golden M is the 13th letter of the alphabet. Fritz Springmeier in his 13 Illuminati Bloodlines has already proven that the McDonald's chain is associated with the Satanic ruling crime families. Using the code above, apply it to the following government and media establishments. And do the math. The number 13 or 33, sometimes both are cleverly hidden in initials. The Illuminati, which is a ritualistic organization that has been around since the Christian crusades has a very special way of looking at numbers and use them for witchcraft. When it comes to the occult and cults that deploy numbers in the use of magic, Pythagoras is the father of numbers and his teachings are venerated by all of the mystery schools. In “The Secret Teachings of All Ages”, author Manly P. Hall devotes Chapter 13 to Pythagoras. Pythagoras taught only the initiates in his own mystery school the secrets of number systems. The Illuminati very closely follow the precepts first introduced by Pythagoras. Among the magical mysteries were prime numbers (numbers that have no divisors other than themselves. These numbers which included 2, 3, 5, 7, 11, 13, and so on are widely worshiped by the Illuminati cult in numerology particularly when it comes to setting dates for events. The members of the Illuminati believe also that a chance of success is more likely if the same number is multiplied several times - so they will schedule a special event on a date that has a run of three numbers. Thirteen is simultaneously a lucky and unlucky number. It is considered to be a bad omen because the Knights Templars were arrested on October 13, 1307. However, it is also the number of reincarnation and everlasting life (a lie). The number 13 is very significant to the Illuminati. Each group has a core of 39 members which breaks down into 13 times 3 members. Thirteen make up an administrative group and then that group answers to a Round Table that consists of nine members. The nine is significant because it relates the triplicate of three that is considered very important in all rituals including 3 times 3 times 3. The 3 times 3 times 3 rules in magic apply to an amplification of the original intention of a cast ritual as well as the concept that whatever comes back to you will do so three times three times three. Here are the meanings of the most significant numbers in the Illuminati system of numerology. 0 - For the Illuminati the number zero is symbolic of sun worshipping. It symbolizes the man who is reborn through occult rituals. 1 - This is the number of unity of mind, body and soul. 2 - This is the number of division rather than togetherness as is typical of other number system… It is the number of the total separation of Spirit. 4 - The number of foundation. Aleister Crowley wrote a book called Book Four which was a complete guide to Magic. 5 - This is a number that protects members of the illuminati from Death. The Illuminati also use something called The Law of Fives which is the mind’s power to perceive truth in just about everything. 6 - The number of man. Taken from the belief that man was created on the sixth day of the week. There are 7 Great Ages of the Earth. There are 7 Races of mankind. There are 7 laws governing human life. There are 7 Schools of Mystery Religions. In Theosophy, there is a seven step process of human evolution in which successive races evolve from a lower to a higher form of life. 8 - This is the number of the sun and the sun worshiper. It takes 8 years for Venus to orbit the sun 13 times which is significant to many occult groups including the Illuminati. 9 - The number of divine completion and the number of the fall of man. 10 - The number of law and authority. It is taken from the Ten Commandments. 17 - The number of immortality. 19 - The number 19 is magickal. Lunar cycles are synchronized with Gregorian calendar every 19 years. 22 - The number 22 is a double 11. It is also a reoccurring 2. It is the number of the Master Builder. 27 - The number 27 = 9+9+9 the most powerful magnification of 9 as it symbolizes 3 nines. 39 - The number 39 = 13 + 13 + 13. The highest possible magnification of the number 13. 333 - The number 333 uses the number 3 three times. 333 stands for the one third of the angels that followed Lucifer and rebelled. 555 - The number 555 = 15 = 1 + 5 = 6. When 555 is used 3 times and reduced to a number, it is a hidden 666. The only known meaning to the numbers of evil or sinister triple 5 is enlightenment or illumination. 666 - When 6 is used 3 times it is the number of the Beast. 999 - 999 is a hidden and an inverted 666 and symbolizes hidden evil. The Illuminati are very much into their own classic system of number meanings that have had an impact on their cult and on humankind for centuries. They use numerology to signal dominance and communicate with other members of the cult.